Is God calling me to be an Oblate? Are you a woman whose heart is on fire with love for Jesus? If so, God might be calling you to be an Oblate. 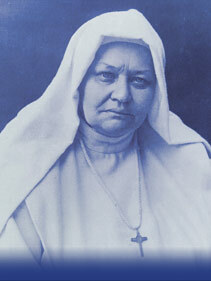 Do you have a great love for the Church, her Sacraments, her Tradition, her teachings? If so, God might be calling you to be an Oblate. Are you attracted to a life of prayer, community, and generous service? If so, God might be calling you to be an Oblate. Do you value the gift of the ordained priesthood and desire to thank God for the ministry of priests? If so, God might be calling you to be an Oblate. Do want an opportunity to support priests in their life and ministry through prayer and collaborative service? If so, God can very well be calling you to be an Oblate. What else will I need to reflect on as I discern? Desire a life of prayer as well as an active apostolate? Have a deep love of the Holy Eucharist? Truly esteem the ordained priesthood? Yearn to give my life exclusively to Jesus? Live a sound moral life? Enjoy good mental and physical health? including at least a high school diploma? Between the ages of 18 and 35? Free from any bonds such as marriage vows, etc.? Free from the dependency of children and parents? For more information see Discernment. CANDIDACY: A brief introductory period to the life experienced within the community. POSTULANCY: A time to learn the various ways of praying and serving within the community. NOVITIATE: A time set aside to study the charism of the congregation and the Vows of poverty, chastity and obedience. TEMPORARY PROFESSION: A five year period of professing the Vows on an annual basis. 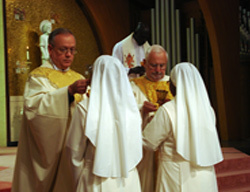 PERPETUAL PROFESSION: A life-long commitment to Jesus and the Church as a perpetually professed Oblate Sister. For more information see Formation.